Oh, hey there! It’s the beginning of the Canadian Thanksgiving long weekend! What are your plans? Better yet, what are you eating?!? 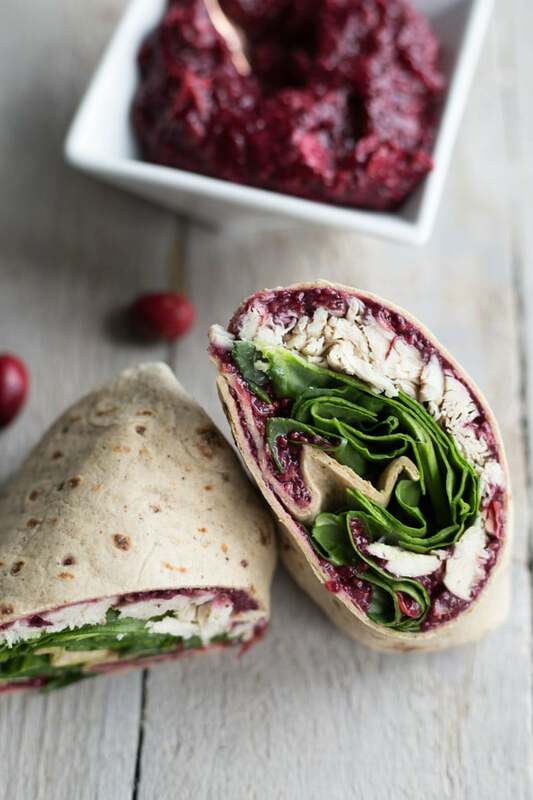 If it’s turkey, you’re probably going to need cranberry sauce. Am I right? At least that’s how we roll in my house! 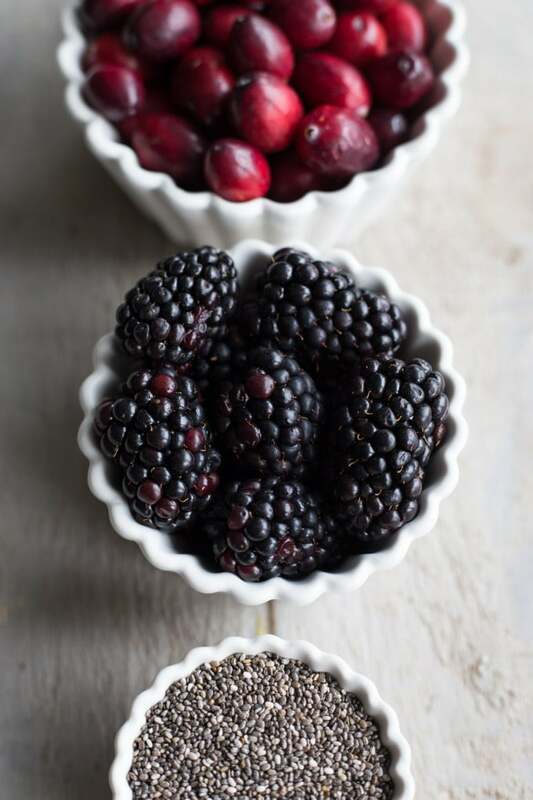 And lately, I’ve been rolling with this Blackberry Chia Cranberry Sauce. It’s seedy and tart and wonderfully delicious! Oh, and clean eating. Yay! Okay, before I go any further, I know what you’re thinking. Blackberries and chia seeds are not messing with my cranberry sauce! But hear me out on this 😉 . I get the convenience of store-bought cranberry sauce. It’s easy, tasty and inexpensive. And I definitely ate my fair share of it over the years! But if you have the time to make homemade cranberry sauce, you should definitely give it a try. I started making it a few years ago and it’s totally worth the extra 20 minutes it takes to pull it together. While homemade cranberry sauce is super delicious, it does have quite a bit of added sugar. 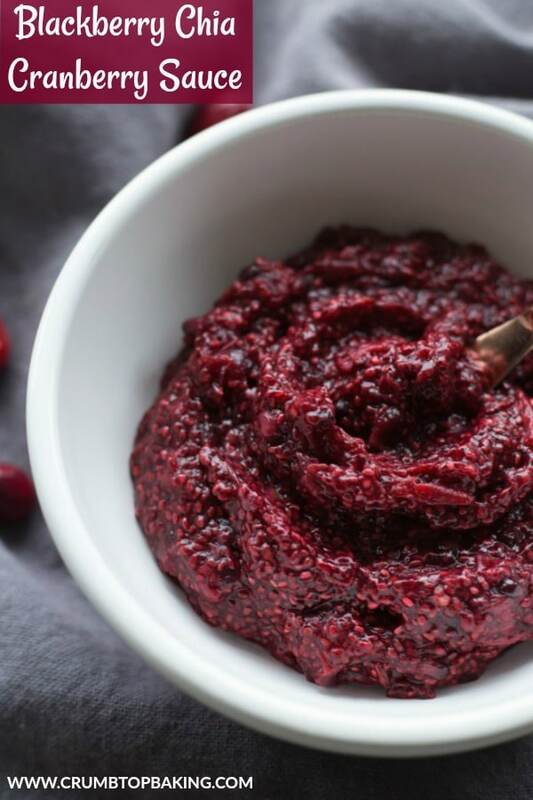 So recently I’ve been making a clean eating version – this Blackberry Chia Cranberry Sauce. It’s still tangy and tart like your usual cranberry sauce. But it’s sweetened with blackberries and a tablespoon of cane sugar, which takes the edge off the tart cranberries. And you also get some extra fibre from the chia seeds. Bonus! And when it comes to using the leftover turkey, sandwiches are an absolute must in our house! 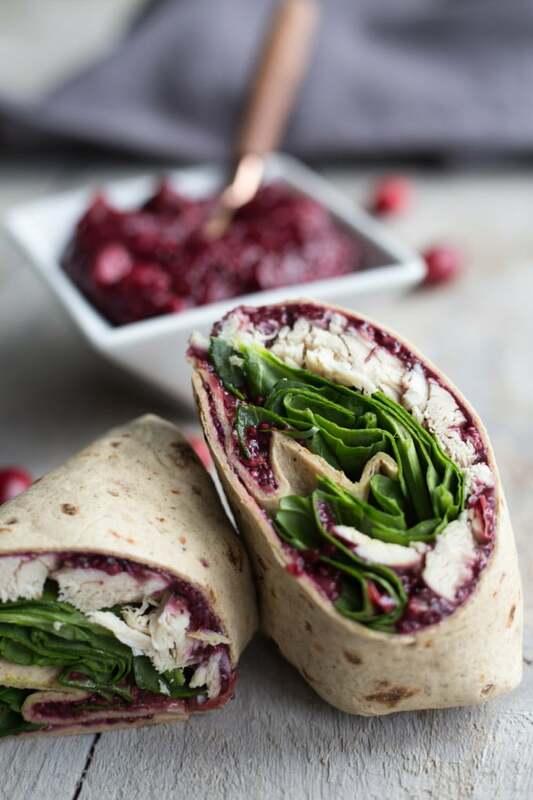 As you can see from the photo above, I like a lot of Blackberry Chia Cranberry Sauce on my turkey and spinach wrap. FYI – this is totally lunch when I go back to work after the Thanksgiving holiday! 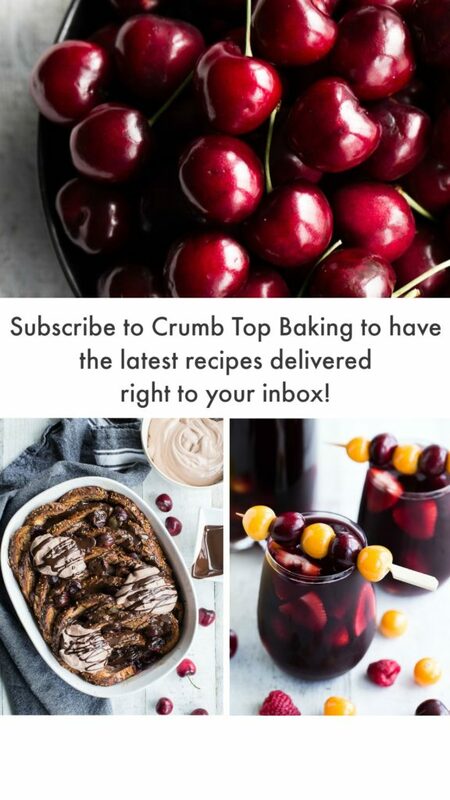 The uses for this cranberry sauce are seemingly endless! Okay, not exactly endless, but you can definitely eat it with more than just turkey. 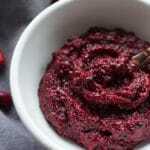 For example, the chia seeds in this cranberry sauce give it a jam like texture (although it’s a bit more tart than jam). So when I recently ran out of chia jam, I started adding this cranberry sauce to my peanut butter toast. And it was pretty darn delicious! Of course, I also love adding cheddar cheese to the top of my peanut butter toast, so you can use that information to make your own judgements regarding my taste 😉 . It’s not for everyone! 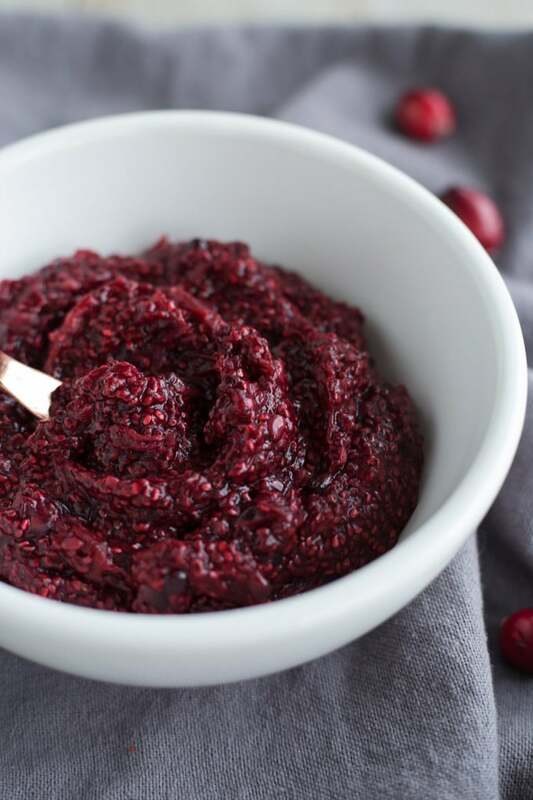 This Blackberry Chia Cranberry Sauce is super easy to whip up so you definitely have time to make a batch for this weekend! You could even do it while you’re waiting for your Thanksgiving guests to arrive! Just sayin’ 😉 ! 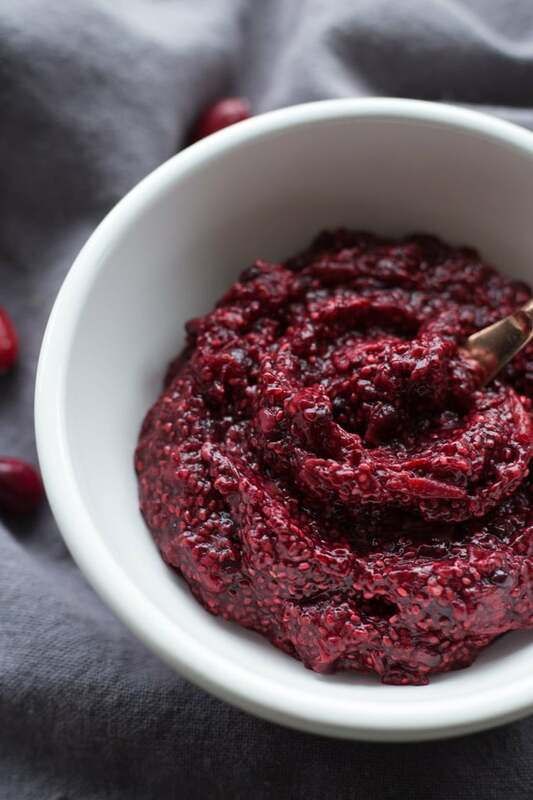 Blackberry Chia Cranberry Sauce is the perfect clean eating addition to your Thanksgiving meal. It still has the same tart taste as your usual cranberry sauce but it’s sweetened with blackberries and cane sugar. And the chia gives it a unique seedy texture, while adding lots of fibre to your meal! In a small sauce pan, add all the ingredients, except the chia seeds, and bring to a low boil. This will take approximately 10 minutes. At this point, the fruit should be a bit mushy. Remove the fruit mixture from the heat and mash with a fork. I like to fully mash the fruit to release all the flavour, which really brings out the tartness of the cranberries. Add the chia seeds to the mixture and stir until well combined. Return to heat and simmer on low for five minutes. (Stir the mixture a few times to ensure it doesn’t burn on). Remove the mixture from the heat and let sit covered for 20 minutes. This will allow the chia seeds to plump up and thicken the sauce. Store the sauce in an airtight container in the fridge and enjoy within 5-7 days. I like thick cranberry sauce. If you prefer your sauce a little thinner, you can reduce the amount of chia seeds.